Camilla Hale chairs the South West Heritage Trust network – a group of over 100 people and organisations closely involved in preservation and conservation of buildings throughout the South West. Two meetings a year are arranged with speakers. Each meeting is in a different place so that we all get the chance to explore new projects and new areas and be inspired by the work of others. The south West is one of the most active areas in the country and there are some wonderful projects across the UK to look at. Three SPT Trustees went to the second Heritage Trust Network Conference in the City of Culture, Hull in October 2017. This was a really stimulating conference on diversity and engagement in preservation projects around the UK. There were some really inspiring talks and examples given of finding the ‘voice’ of buildings and their connection to local communities. The photo is of Anne Mackintosh enjoying some 3d virtual reality. We were also impressed by Hull as a City – new to all of us. The buildings were magnificent and the docks and history fascinating – well worth a visit in its own right, there is so much to see. The volunteers were so friendly and helpful and one said that they were excited to come to Stroud to see the Anti Slavery Arch, they knew all about it! Hull is where Wilberforce was born and brought up and looking at freedom has been a key element of the City of Culture’s programme. 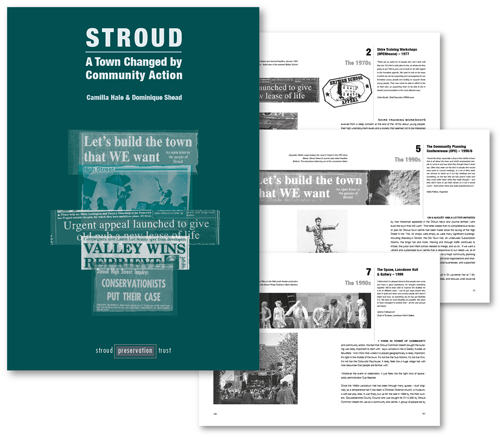 'Stroud – A Town Changed by Community Action' is Stroud Preservation Trust’s latest publication for sale from December 2013. It covers ten significant community projects and campaigns over the past 40 years in Stroud and charts the difference they have made to the town, the economy and the community. 32 people were interviewed for this book of living history. A further 67 projects and campaigns have been collated to show the extraordinary vibrancy of the town of Stroud and the people that live here. For anyone interested in the recent history of the town this book, full of quotes, photographs and newspaper headlines is a must! Available from Stroud Bookshop; Stroud Valleys Project and Uplands Post Office. > BUY THE BOOK HERE!